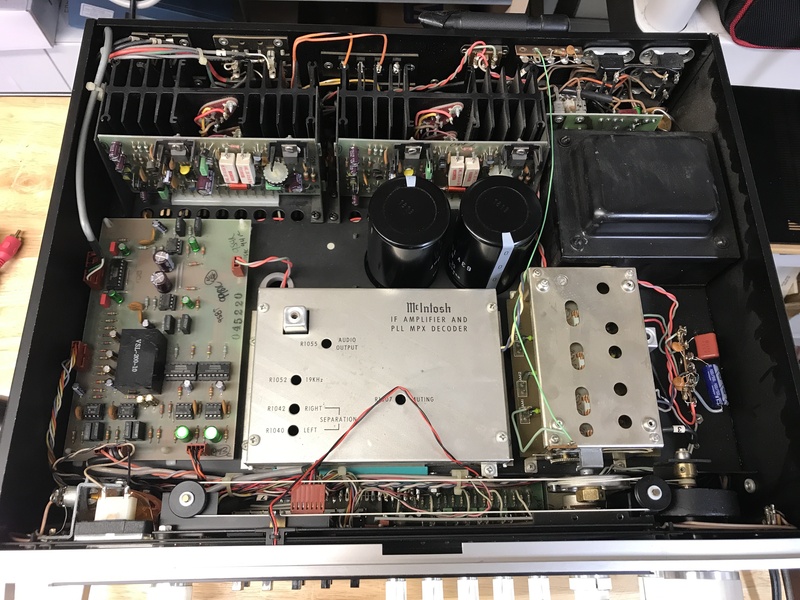 We got this McIntosh MAC 4100 receiver in on trade from a regular customer of ours who wanted credit towards another restoration. With the exception of a few marks on the case, it was in very good condition and worthy of a restoration. Before we got started, we checked the unit over. DC offset was negligible, the tuner and phono sections were working fine. Both channels worked through all inputs, and all controls worked with only some scratchiness in the potentiometers. We took the case and faceplate off and got to work! First thing we did was recap the power supply. This board takes a lot of stress as the regulators put off a lot of heat. They are mounted on a aluminum bracket that also holds the board in place under the chassis. 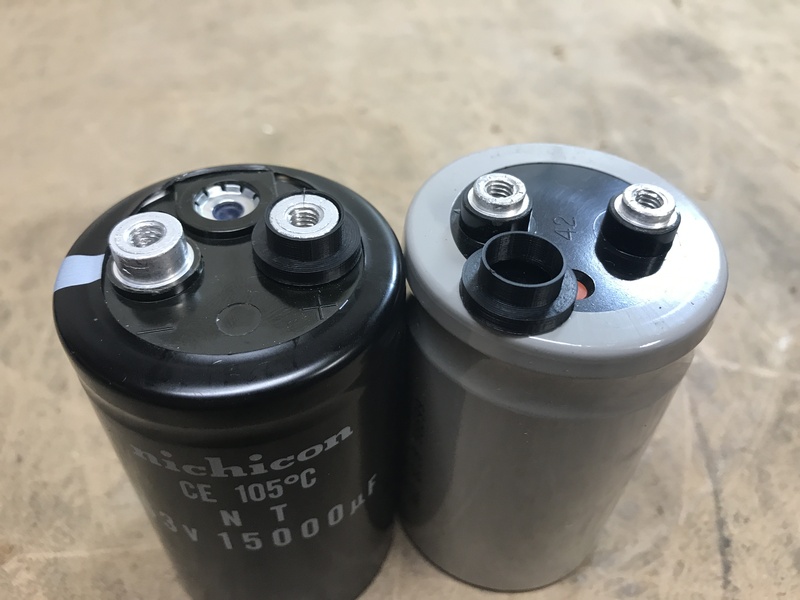 We replaced all the light blue electrolytics with Nichicon PW caps, which are highly reliable and made to withstand high temperature. 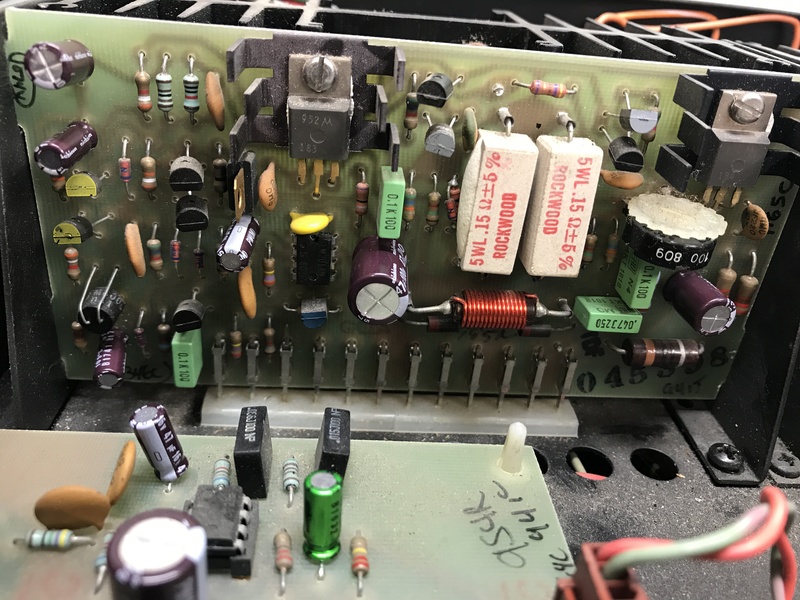 There was one orange colored low-noise capacitor on the board which was low noise. It is a 10 μf capacitor. It was replaced with a Nichicon Fine Gold low noise cap. The regulators were working fine, so we cleaned off all the old thermal paste from the original transistors and applied some fresh paste in its place. Where the bracket is mounted on the chassis, there is a long strip of thermal paste. That was also cleaned and new thermal paste was applied. This will help the regulators to shed heat more efficiently and held the unit run cooler. The top picture to the left is the original board, the lower one is after a recap. 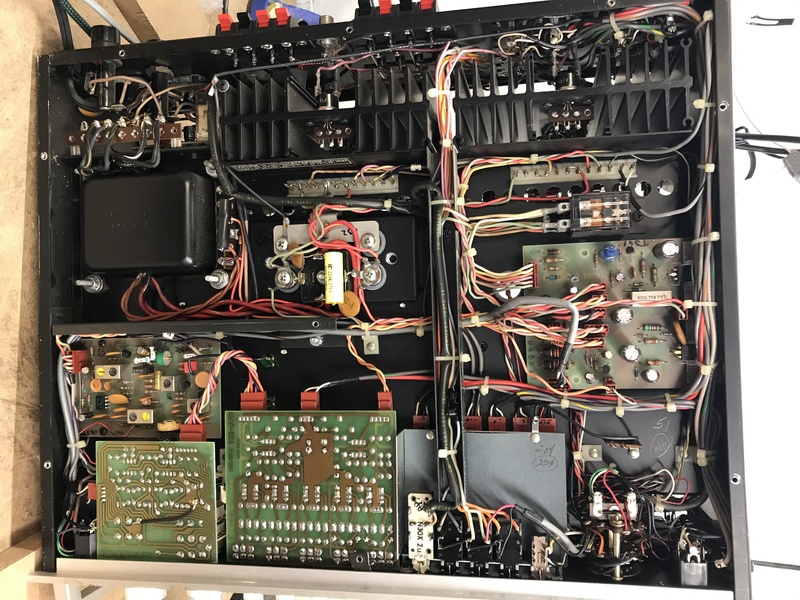 The unit uses mostly wiring harness connections between boards, and most of them can be completely removed from the unit. 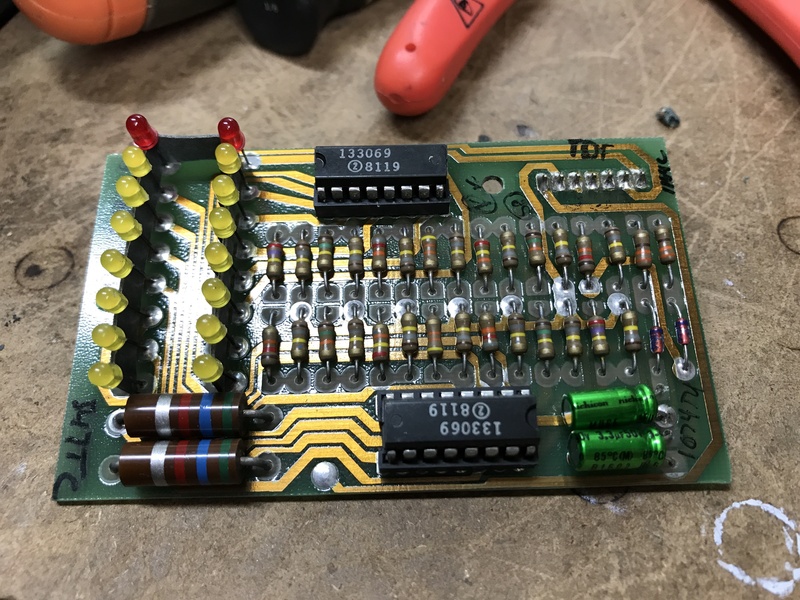 The power supply has many connections, and is easy enough to just manipulate the board with them all attached. This way you don’t have to worry about hooking everything back up incorrectly… which can end up pretty bad. These two little caps by the fm tuning cap were changed. The 1 μf was changed to film, and the 100 μf went to a Nichicon axial electrolytic capacitor. The volume/balance/loudness board can be removed completely from the unit. This makes working on the board stress free. Many units that don’t use wiring harnesses or card slots have brittle wires which can snap without you noticing. Then when you try to test the unit after your recap, it can wreak havoc as you try and trace the problem. The little yellow ‘lytics are low noise caps (above left). In their place we swapped in red WIMA film caps (above right). 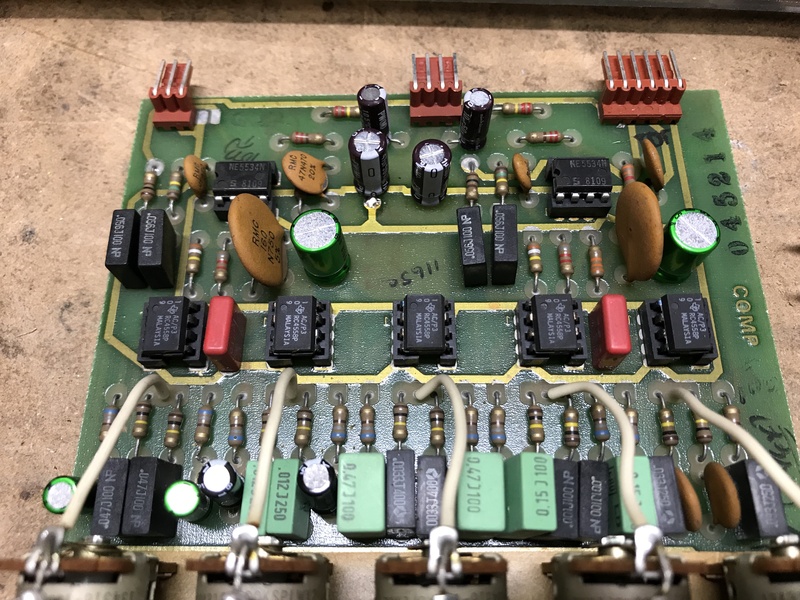 Replacing electrolytic capacitors with film is beneficial whenever possible for the signal path. They are more reliable and sound better. Film caps also work if you don’t have a non-polar/bipolar cap in the rating you need, as they are non-polar. The brown ERO non-polars get swapped for Nichicon MUSE series bipolar caps. The two light blue Rubycon filter caps are replaced with Nichicon PW caps. The volume control is sealed. Sealed controls are both bad and good. If they do not develop noise, that’s fine, as you can’t spray cleaner in them anyways. Some still develop noise and cleaning them involves breaking the seal, which can be a real pain. Luckily, this unit had a quiet volume control. The balance control however, was noisy. It is an open potentiometer, so we cleaned both the balance and loudness pots. The new DeOxit cans come with a terrible, unremovable stray and unadjustable spray strength. 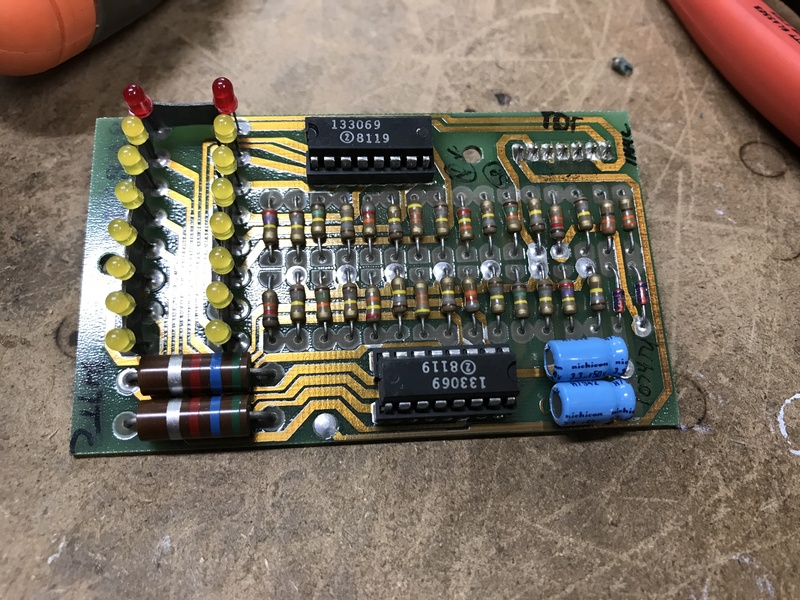 Having the board completely out of the unit makes cleaning controls neater, avoiding overspray and leaking from the terrible, terrible new DeOxit cans. The tone/eq board was next. More of the same… The brown ERO non-polars and light blue non-polars are swapped with Nichicon Muse bipolars caps. The original, orange, low noise Nichicons are replaced with KL series low noise Nichicons. The light blue Rubycon filter caps are again replaced with Nichicon PW series high temp/high reliability caps. This board is double sided, as there are a few traces that run along the top side as well. The Rubycon caps have traces on the bottom that lead nowhere, so they will pull from the board if too much heat is used. Be careful de-soldering and removing the original caps to keep the traces in tact. 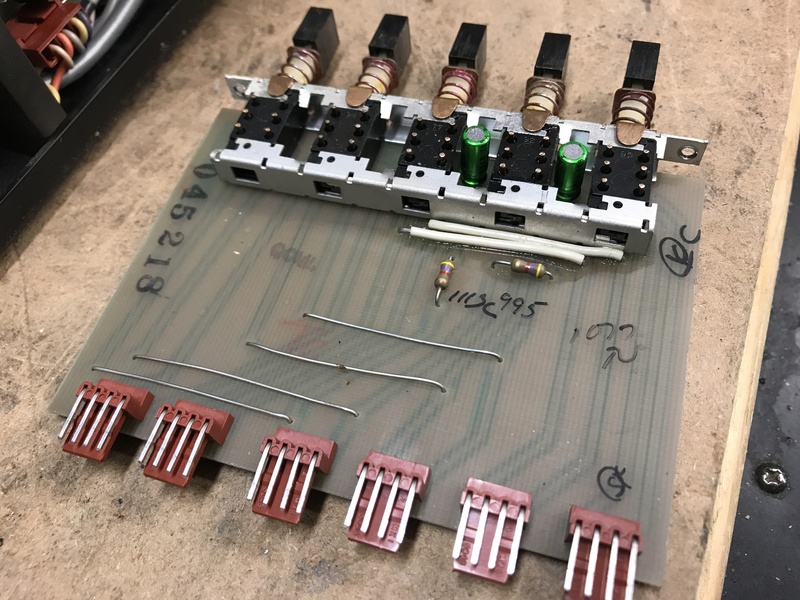 When soldering in the new caps, we soldered both side of the double sided traces to ensure a solid connection. 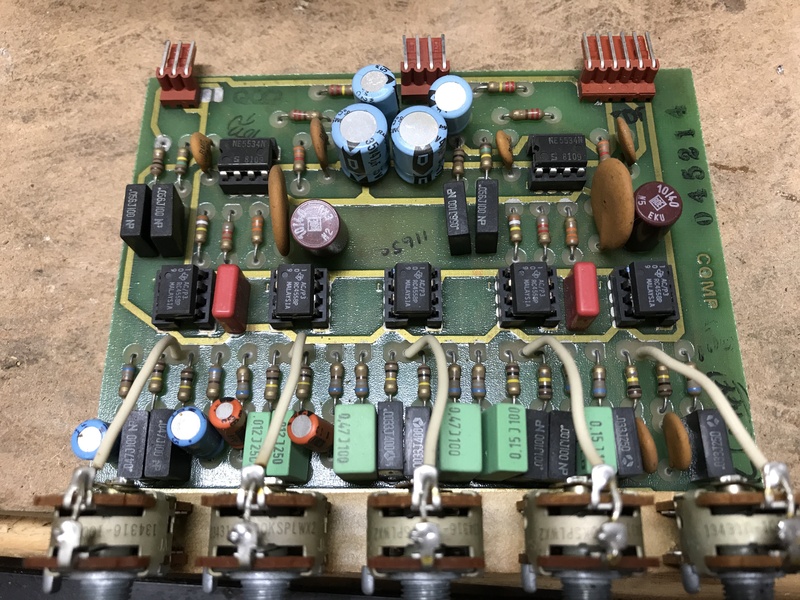 In the above right picture of the recapped board, you can see the top trace soldered on one of the PW caps in the rear of the board. The controls for the EQ bands were noisy, so they were cleaned before re-installing the board into the unit. Sometimes the male pins on the wiring harnesses get tarnished and cleaning is required. These pins all looked very clean in this unit. The tape filter board has two small non-polar caps on it. These are probably there to prevent popping when selecting between the buttons on this board. These are replaced with Nichicon MUSE bipolars. This board is tucked away and takes a little effort to free up. Make sure to take pictures or mark which harness goes where, to prevent plugging things in where they don’t belong. This is the “auto-on” pc-board. 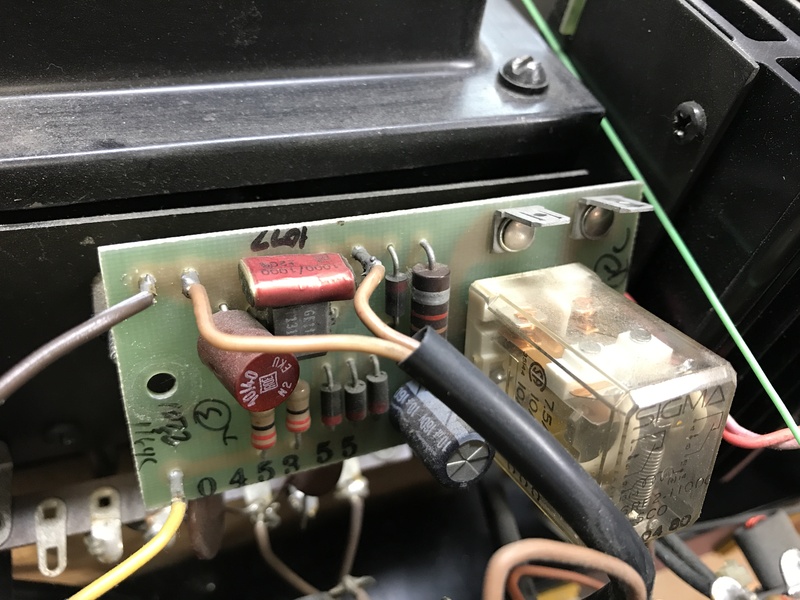 This board re-routes the AC to another unit plugged into an outlet on the rear of the receiver. When that unit is turned on, the 4100 will then come on. This takes some of the abuse off the 4100’s power button. 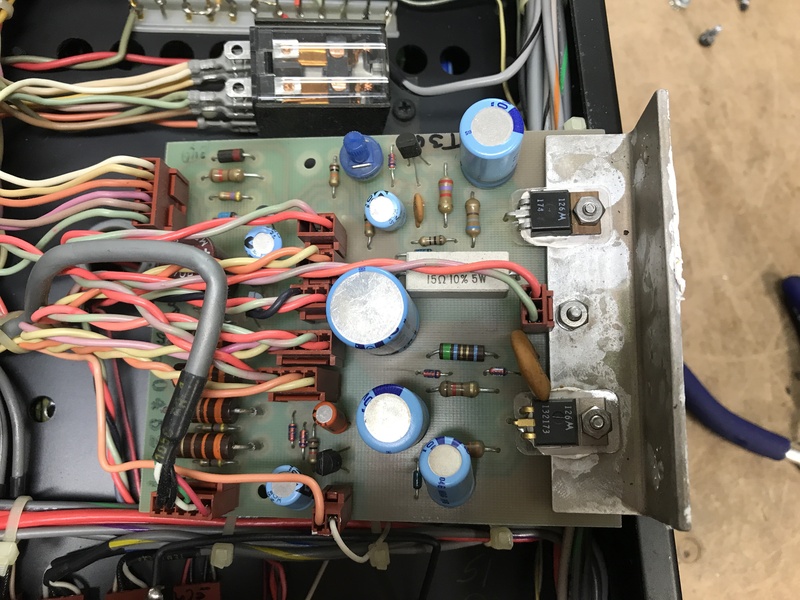 The original is on the left, and the recapped board on the right. Just two caps. This is the preamp board. The before picture is below on the left, and the after, on the right. There are many non-polars on this board, all replaced with the green Nichicon MUSE bipolar caps. The filter caps went to Nichicon PW, and again, the low noise orange caps went to Nichicon Fine Gold caps. The two WIMAs you see in the back corner were .47 µf caps, switched to film caps. We just didn’t have .47 µf electrolytics caps on hand at the time. This is the power meter board. Two new bipolar capacitors go in. Again, this board is double sided. Be careful with the heat when taking the old caps out, and it would help to again directly solder both sides of the double sided leads. Make sure to fold the cap flat to the board before soldering to prevent breaking any traces. 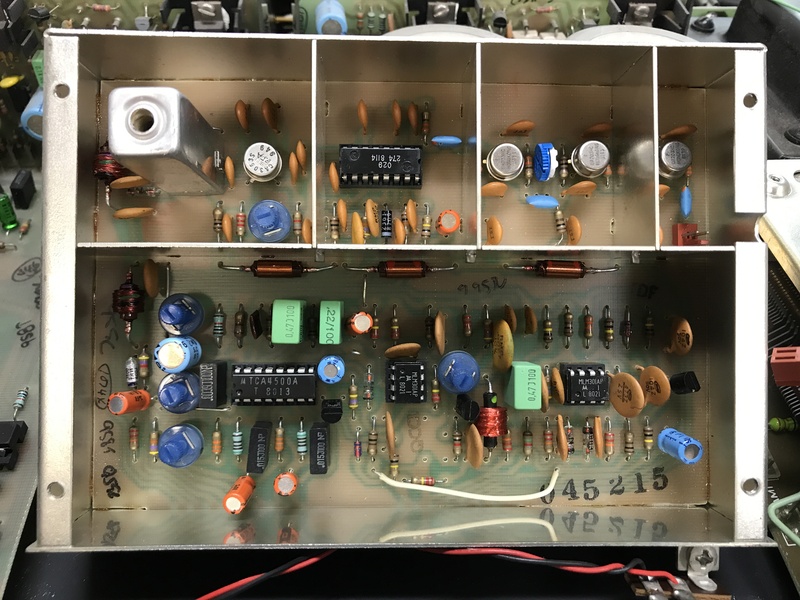 The AM/FM boards in this unit are relatively sparsely populated compared to other vintage tuners. It uses an auto-frequency lock circuit that shows when you are directly tuned to the center frequency for the station. These MAC 4100 have great tuner sections. This is also a later production unit and has the tuner boards that are shown in the service update from Mcintosh. Considering the unit was already open and the board were very accessible, we recapped them. Business as usual. Nonpolars went to bipolars/film caps. Low noise caps were changed with new low noise audio caps. The light blue filters were replaced with Nichicon PWs. The slideshow below shows the before and after pictures of the boards. The original AM board. The board doesn’t come completely out, but there’s plenty of slack to easily work on it where it is. Only 4 caps to change. This is after the recap. Simple! There is only one cap on this board that isn’t low noise or non-polar, C1021, which is a 10 µf electrolytic. The rest are all non-polar or low noise. WIMA film caps were used in place of non-polars where the values were lower, otherwise Nichicon bipolars were used. Nice shiny Fine Gold low noise caps took place of the orange caps. The amplifier boards are unfortunately not completely detachable from the unit. The components mounted to the heatsink are soldered in, no attached by wiring harness. To remove the boards from the heatsink in order to have enough room to work on the board, you need to take the screws out from the chassis that hold the heatsink in. Then, remove one of the plates on the side that hold the board in place by the shallow tabs you can see on both sides of the board. 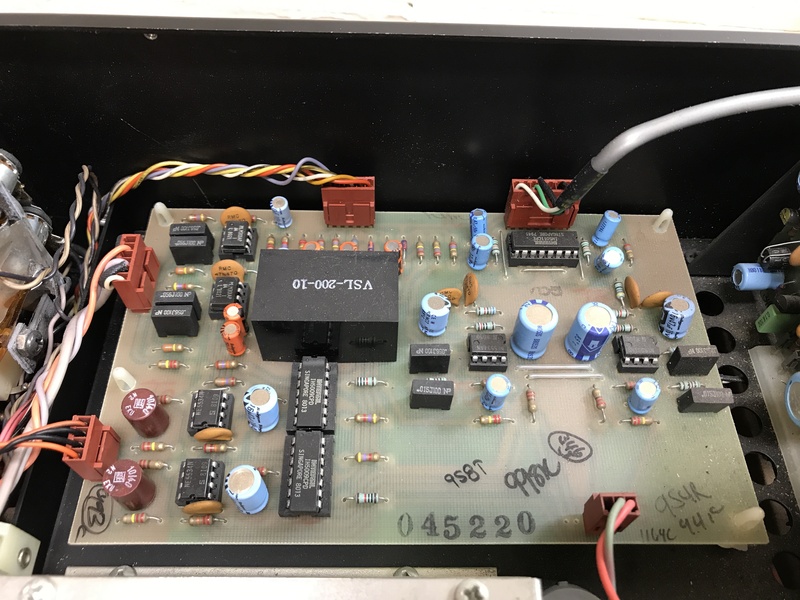 Then you will be able to pull the board up and out, away from the metal spikes the connect the amp driver boards to the rest of the unit. 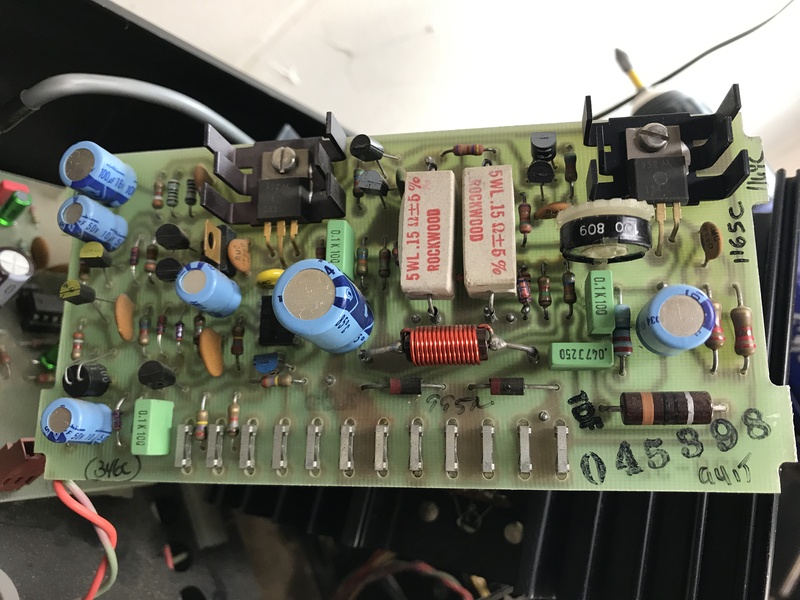 On these amp boards, the capacitors that need to be replaced are all light blue filtering caps. They will all be replaced with high-temp/high-reliability Nichicon PW series. Many high end audio components use PW or VZ caps in filtering positions. 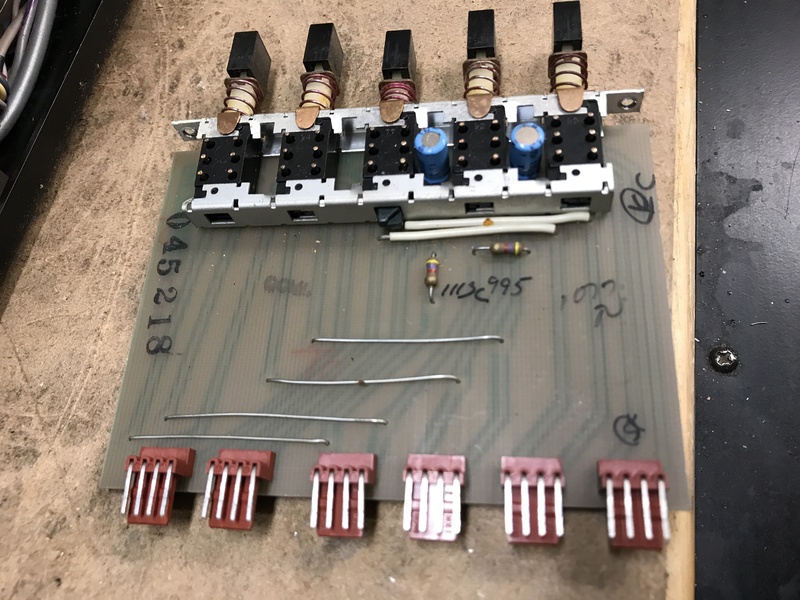 We use the same, and we have all the common capacitances and voltages needed on hand. For most solid state units we restore, the only caps we need to order are the large filter caps. We order the large filter caps as close to the original size as possible so they fit in the original positions. Sometimes we need to order weird rated caps or bipolars that we don’t have on hand. We have stacked up by now though so that we do not have to worry about not having them stocked. We were wrapping the recap of the 4100 up. At this point the boards are all done. We plugged it in to test, and it worked fine. Controls were clean, signal passed through all inputs and sounded good! 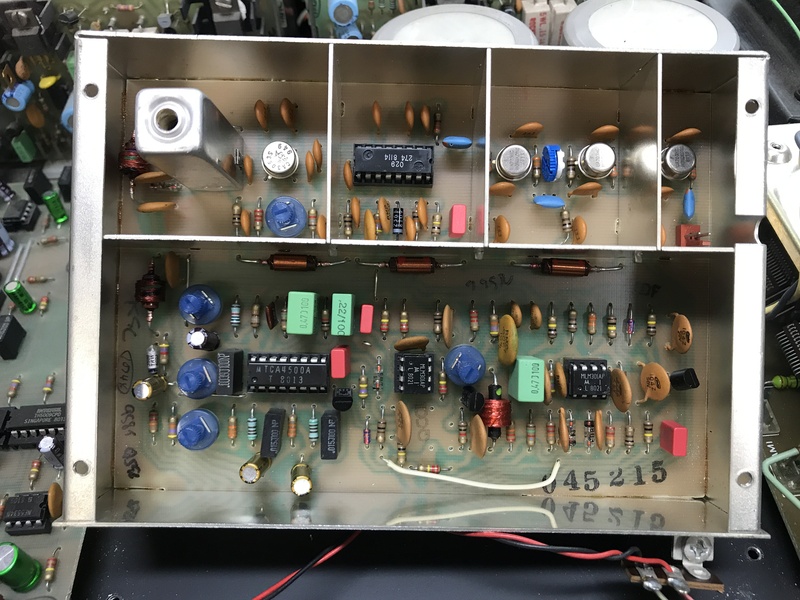 The amplifier has no DC offset adjustment, but it was tested for offset and it was less than 10mV in each channel, so no worries! 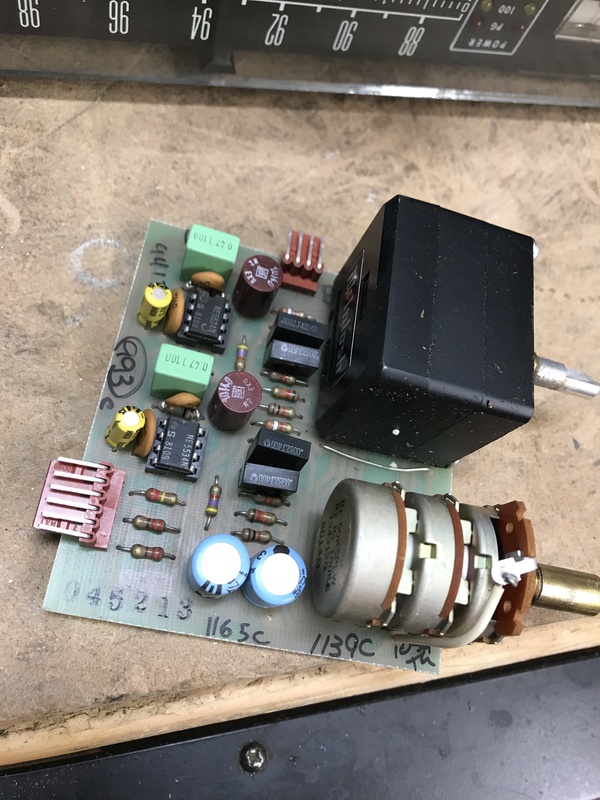 This unit has matched input-pair transistors as it is a balanced differential amplifier. 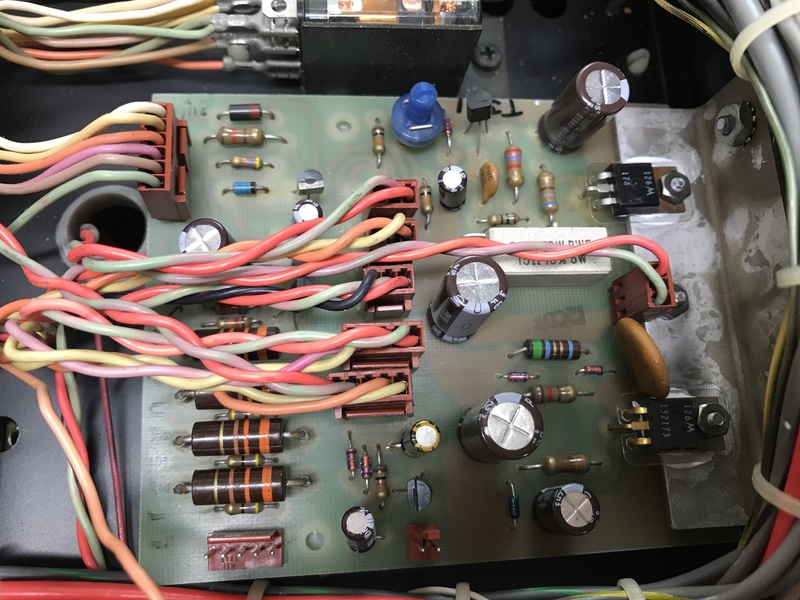 The transistors were fine, and still matched close enough to keep the amplifier from putting out significant DC voltages. 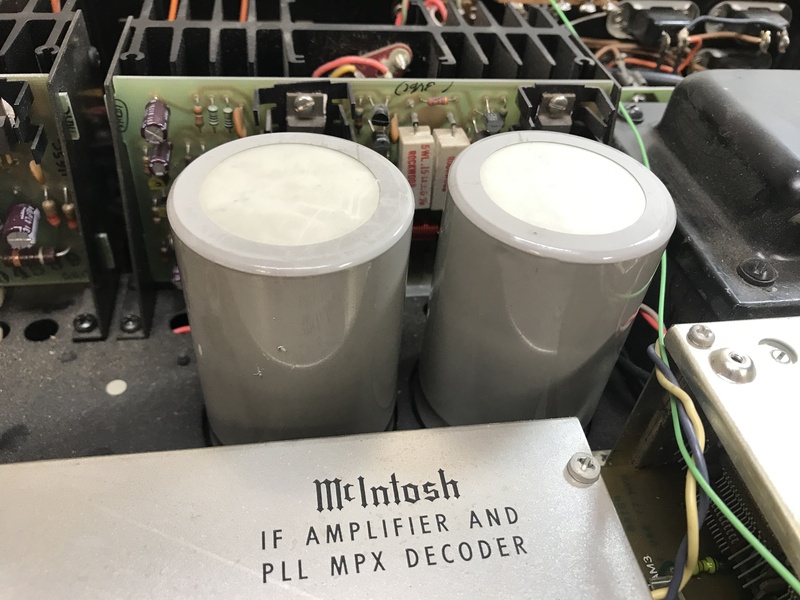 Setting bias on McIntosh components is a bit different. The manual specifies using a wattmeter to set bias/idle current. 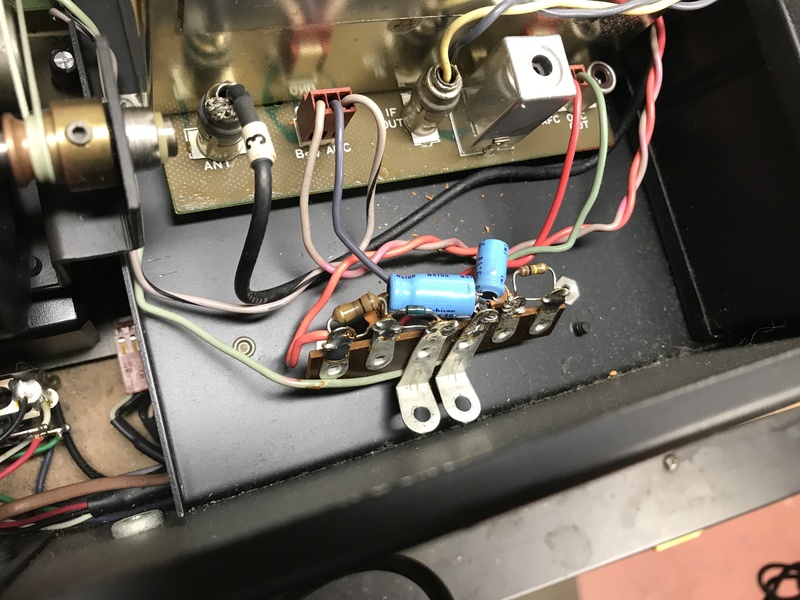 I did notice after a few minutes, the right amp was getting VERY warm, which I didn’t notice before the restoration. I new bias needed to be adjusted. 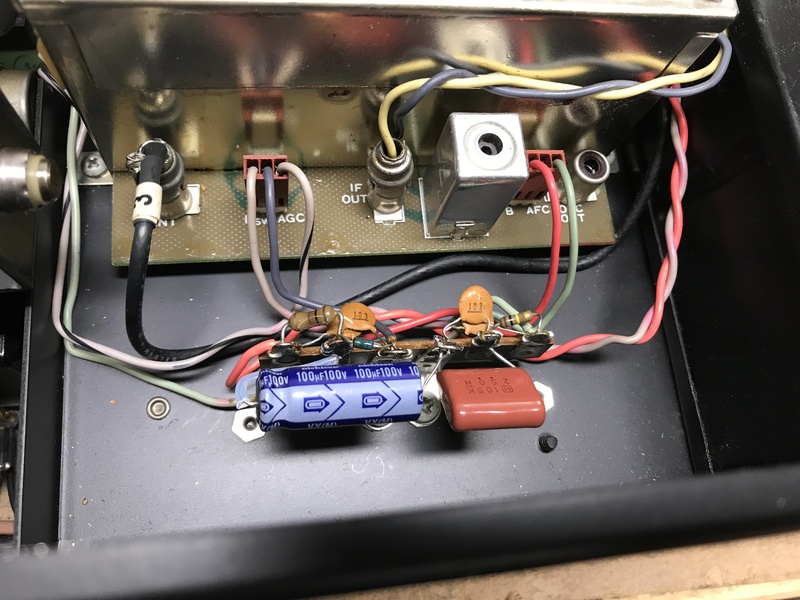 Turns out, the bias potentiometer was turned almost all the way up (there was a sticker from another audio service shop on the bottom, but I won’t point any fingers or name any names). 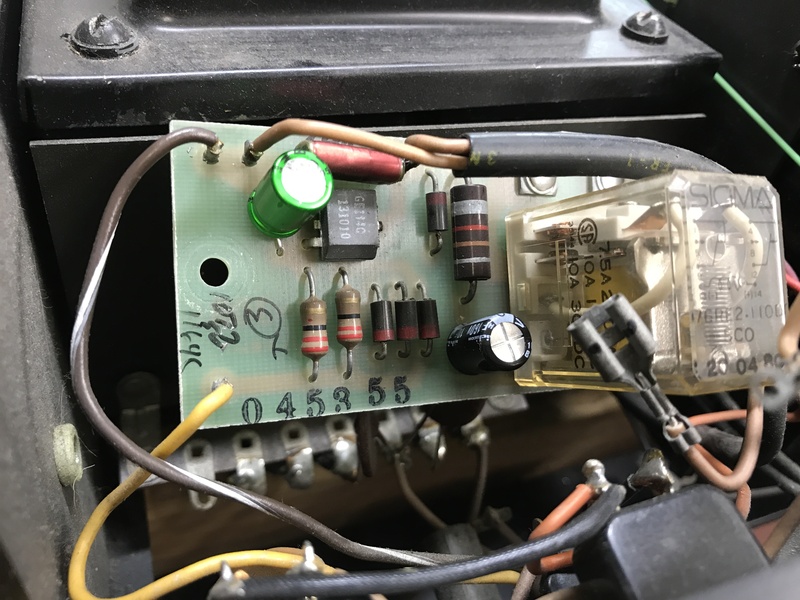 I reset bias according to spec using a wattmeter, and the unit was running as it should. The unit sounded good, but I hoped it would sound better. Sounded a little flat and un-energetic. It didn’t have the big bottom end that McIntosh usually has. Hopefully changing the main filter caps would help that out! As they have just arrived in the mail, we can swap those in. Old caps above on the left, and new caps on the right. 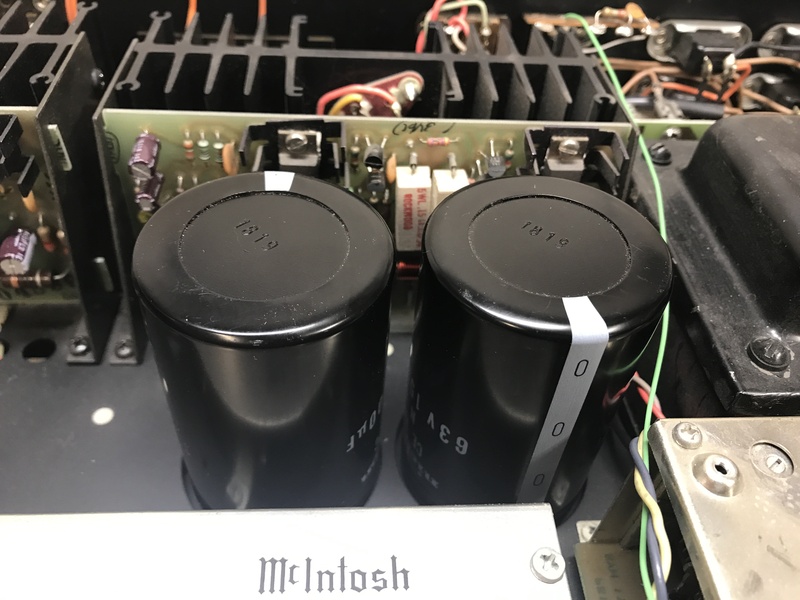 The amplifier section of the McIntosh MAC 4100 24,000 µf of capacitance (12,00o µf per cap), which is a lot for a 75watt amp. 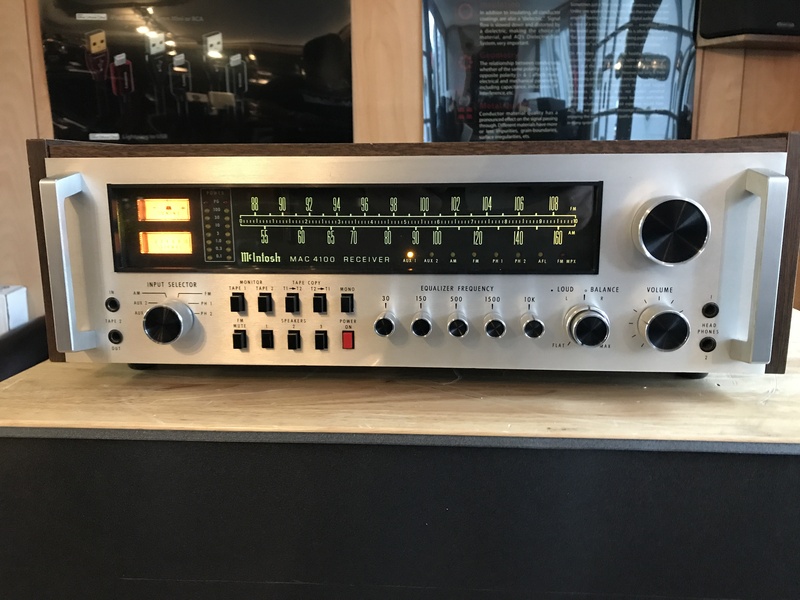 Comparably, the Marantz 2270 has only 18,000 µf. 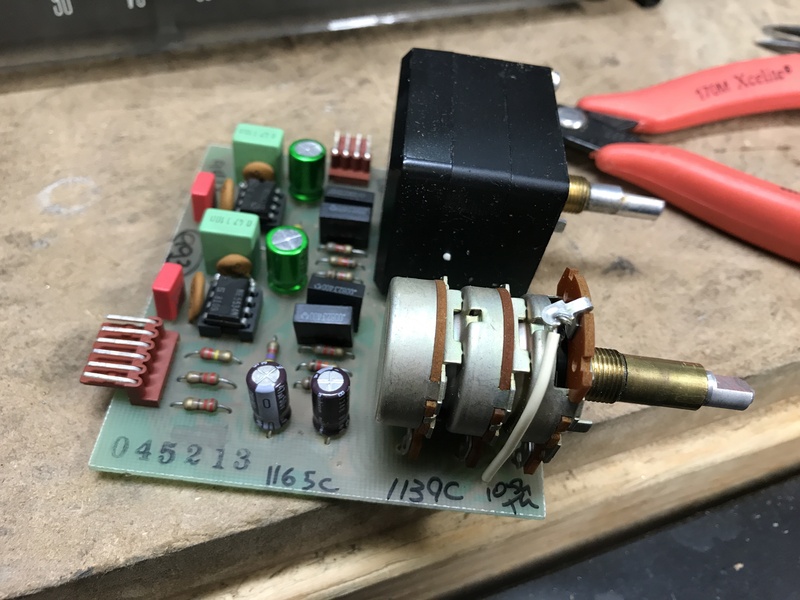 Being that newer capacitors are smaller, in many cases you can upgrade the capacitance slightly while still having them drop right in to the same mounting. 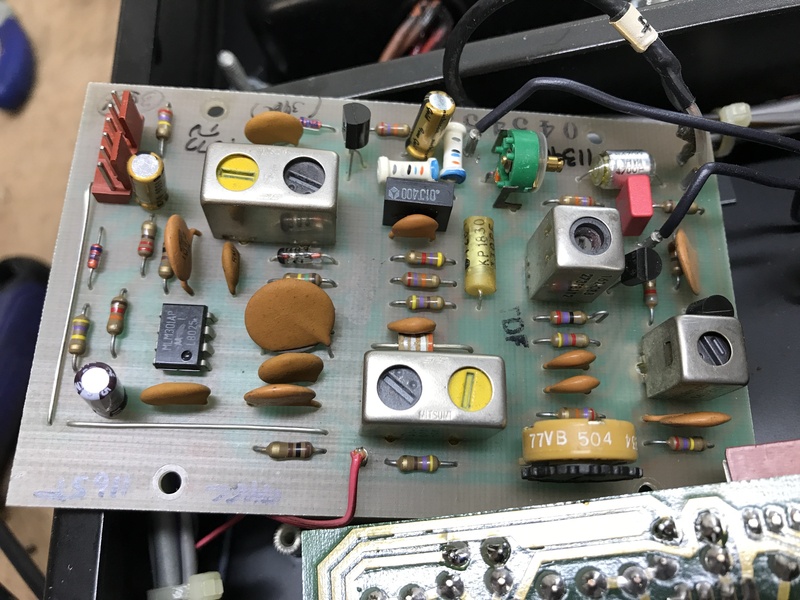 For this MAC 4100, we used Nichicon 15,000 µf capacitors, for a total of 30,000 µf capacitance! The amp section will have plenty of clean power reserve. Now we ran into a unique problem. We ordered replacement capacitors, and worked on the rest of the unit as we waited for them to arrive. 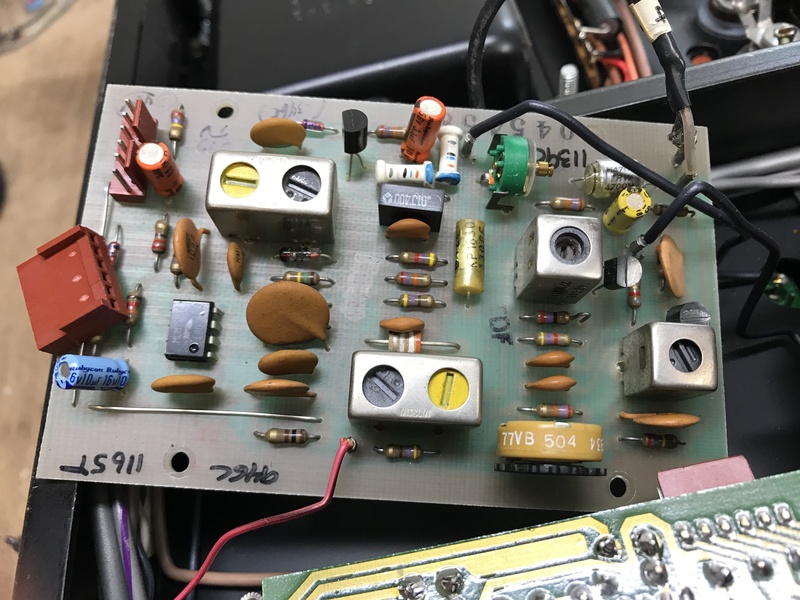 I noticed the older capacitors had a plastic collar around the lugs, preventing them from touching the chassis where they are mounted in the unit. 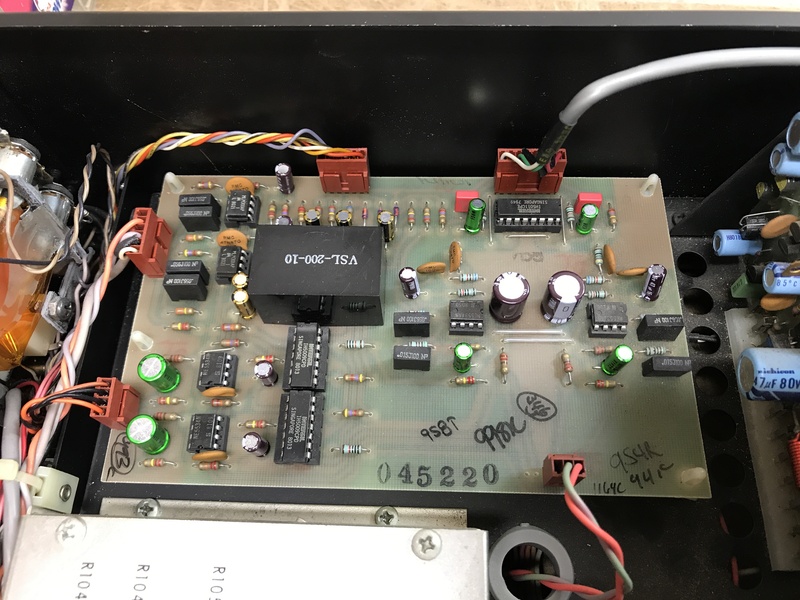 The new capacitors had a huge risk of touching the chassis, which would be catastrophic. The best solution we came up with was to 3-D print a collar that would fit around the lug. After a few measurements were taken, and a few drafts were printed, and a few measurements were slightly changed, and a few more were printed, we ended up with a great solution! In the picture below you can see the old caps’ collared lugs, the new cap lugs with and without the collar. They worked perfectly! With the new main filter caps that were upgraded to a total of 30,000 µf, the unit sounded much more dynamic and punchy. The unit was almost done. We replaced the dial lamps with soft-white LEDs to maintain the original look. The lamps behind the tuning meters were left. They’re difficult to find a good-looking replacement for, they’re bayonet style, they are surrounded by a fragile, orange colored film, and they are difficult to get to. Being that they work, they were left. The case and face were cleaned and put back on, the knobs were cleaned with out ultra-sonic cleaner and put back on. 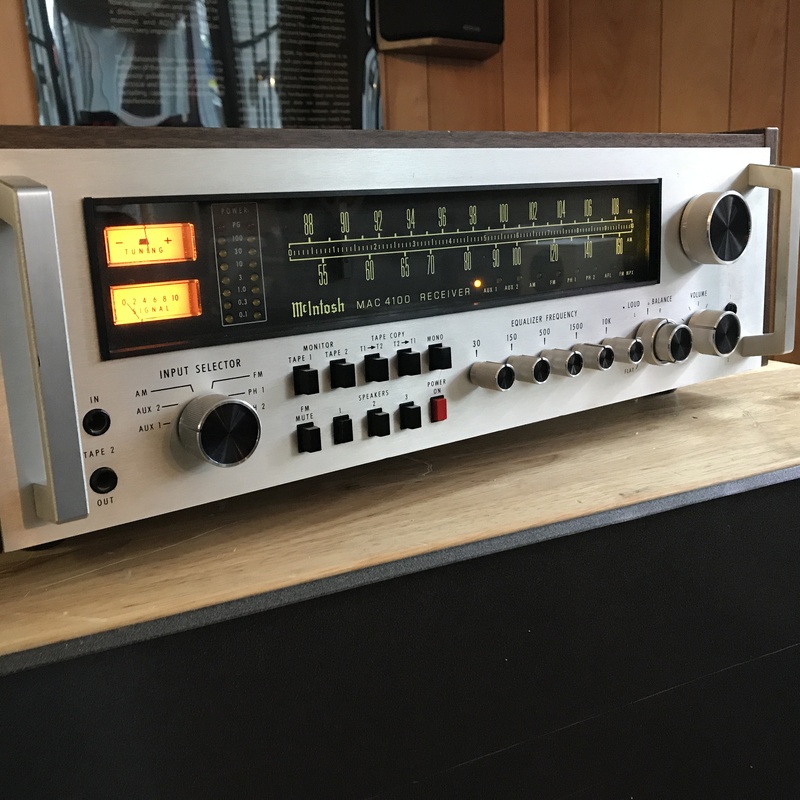 The unit sounds just as good as it looks, and is for sale in our store! Come in and give it a listen!